If you have been looking for a great little exercise bike that will provide you with a great workout but won’t take up a lot of room in your house, then the Ultrafit F-Bike is definitely an option that you should consider. Not only is this bike small enough to easily be hidden out of site, but it also has enough bells and whistles that will allow you to get a great cardiovascular workout. In this Ultrafit F-Bike review, you are going to learn more about these great features and find out whether or not you should buy the Ultrafit F-Bike or not. 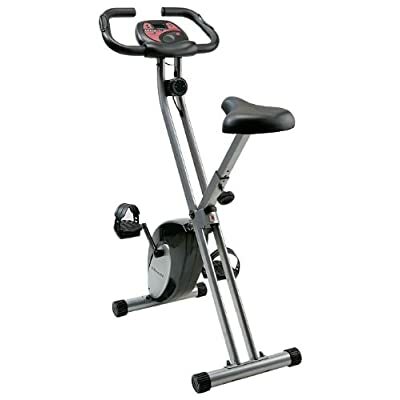 The Ultrafit F-Bike is one of the most popular portable exercise bike's available today. As a matter of fact, it has more than 100 positive reviews on Amazon from customers who are absolutely thrilled with it. Essentially, it is a portable exercise bike that will allow you to get the ultimate exercise bike workout forcing you to sacrifice a lot of space on your home or money out of your pocket. One of the biggest benefits that many people love about this exercise bike is that it can be folded away for easy storage. It uses a space saving folding technique that allows it to become so small that you can easily store it in a corner so that it is out of the way. This is a very convenient feature especially for someone who does not have a lot of room to sacrifice to exercise equipment. It's also very easy to assemble with very few parts to work with. The most amount of work that you will have to do amounts to tightening a few nuts and bolts. Many users love the fact that it has a quality construction that actually feels very expensive. Since it is very durable, you can be sure that it will be ready to work for you for many years to come. The flywheel that it uses is powered by a belt transmission system and is very lightweight at only 1.5 kg. It also operates very quietly so that you can even use the bike while you are watching your favorite TV shows. The bike is sturdy and stable enough to support a person of up to 100kg, so it will be suitable for many people to use. When it comes to actually using the Ultrafit F-Bike, there are many great features that will allow you to get the ideal workout. It allows you to choose from 8 different resistance levels so that you can choose the best workout for you. It also has a convenient LCD display that will allow you to monitor many important statistics including distance traveled, pulse, calories burned, and current speed. The ability to measure your pulse is a very cool feature because you will allow you gauge how effectively you are working your cardiovascular system. It is able to monitor your pulse because it uses hand pulse sensors that are built right into your handlebars. The Ultrafit F-Bike will give you the ability to own an exercise bike that does not take up a lot of room and will allow you to get a very good cardiovascular workout. It's very easy to assemble, very easy to maintain, and also very affordable as well. If you want to be able to buy the Ultrafit F-Bike at the best price possible, then one place that you need to check is Amazon. They have many great deals on all of their exercise bikes and many of them even qualify for free shipping.